Someone stepped on this ant. 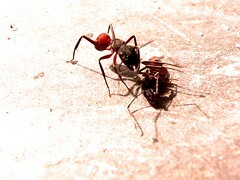 Soon after, there was other ant who was there, not really being able to go away, walking round and round the dead ant. Alguien pisó esta hormiga. Al poco, llegó otra hormiga, sin poder realmente marcharse, dando vueltas y vueltas en torno a la hormiga muerta.